Product prices and availability are accurate as of 2019-04-04 11:51:59 EDT and are subject to change. Any price and availability information displayed on http://www.amazon.com/ at the time of purchase will apply to the purchase of this product. 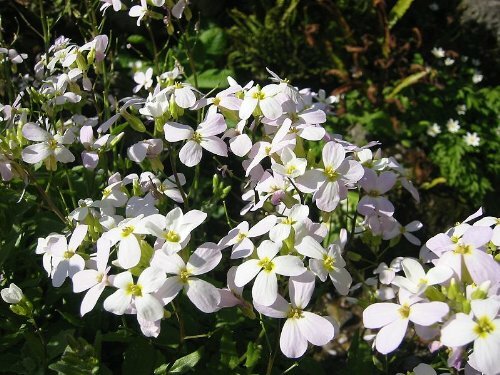 * Visit the store for Purple Rockcress and Rainbow Rockcress! * ** FREE SHIPPING ON ANY ADDITIONAL SEEDS! PAY ONLY ONE FLAT SHIPPING FEE OF $2.50 FOR US ORDERS NO MATTER HOW MANY YOU ORDER! PLEASE VISIT MY STORE FOR OVER 800 TYPES OF FLOWER, HERB, FRUIT & VEGETABLE SEEDS!!! ** FLAT RATE SHIPPING TO CANADA AND WORLDWIDE IS JUST $3.50. Sorry, no shipments to Italy at this time. All seeds will come in a resealable plastic zip lock bag with a label featuring a picture of the flower, planting instructions, and plant specifications such as height, spacing, and light requirements for easy planting. If stored properly, seeds can last for years! All seed packets contain 100 percent true named seeds - there are no fillers or other weeds or seeds mixed in. Most have been harvested by hand and all test at an exceptionally high germination rate. Combined free shipping applies to an unlimited number of seed packets paid for together at checkout within the required payment time of 7 days after last purchase has been made. International buyers please check with your local customs office regarding regulations and allowances on plant seeds. I cannot be responsible for anything seized by customs or irratiated by your local post office. Please understand there are too many countries and too many types of seeds for me to be able to research every possibility. All international shipments will be sent First Class Mail International. You will be provided with a tracking number but please remember that international shipments take longer to arrive. If you have any questions about shipping, ordering, or the plants themselves, please feel free to send me a message. While I do not claim to know everything, I will be more than glad to answer any questions I can either from my own extensive experience or will do my best to try to find an answer for you. 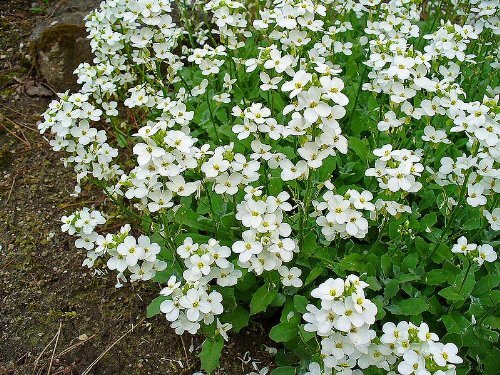 BLOOM TIME: Spring HARDINESS ZONE: 3 - 8 PLANT HEIGHT: 4 - 6 LIGHT REQUIREMENTS: Sun - Part Shade . . . 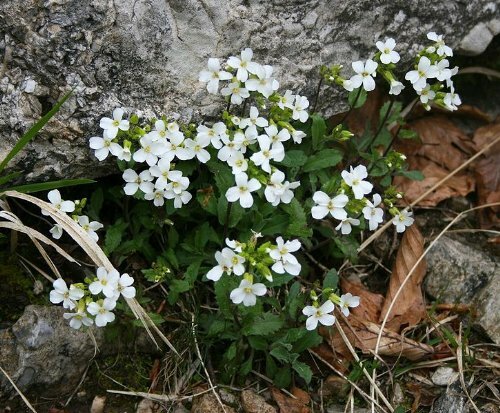 SOIL / WATER: Dry Rockcress grows low and wide making it an excellent ground cover, rock garden plant, or ornamental cascading over walls. 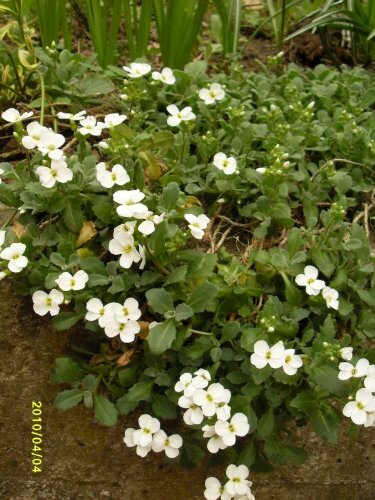 It also looks great in pots or hanging baskets. 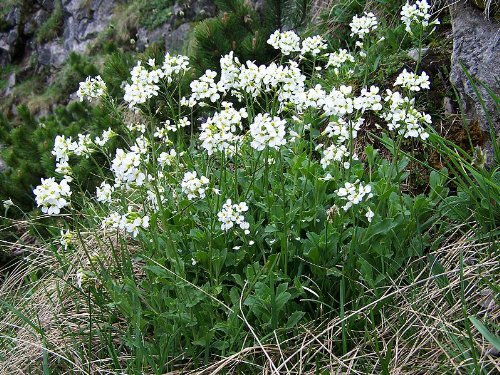 Rockcress can rebloom if it is gently sheared after its first flowering cycle. 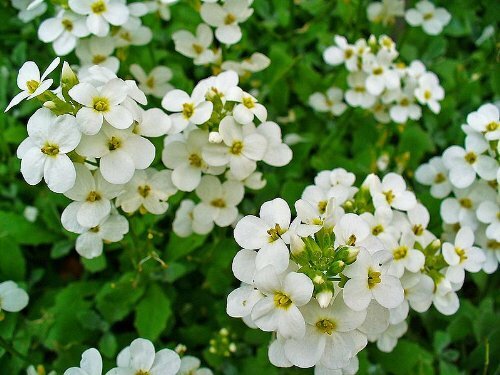 It is fragrant and attracts bees, butterflies, and birds.